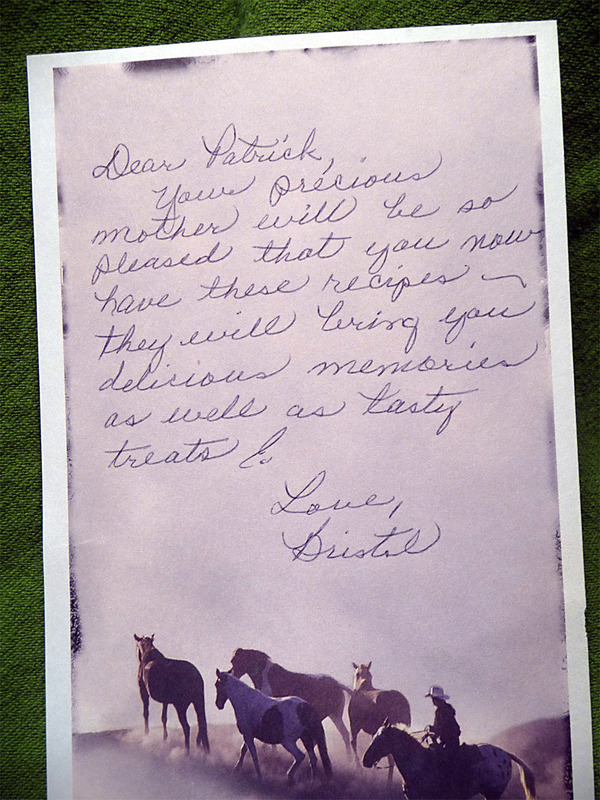 I was nervous having Bristol mail Mom’s cookbook to Dallas vs. me flying down to retrieve it in person. It wasn’t “her,” it was the USPS I was worried about. But she insisted on it as she didn’t want to inconvenience me. I agreed, thinking if this was meant to be, it would be. After a week of nail biting, an old, large box finally arrived at my doorstep on May 9, 2011. I placed the box on my kitchen counter and marveled at it for a full day, wondering how my life would surely change after opening it. But what, exactly, was in the box? On day two, I finally mustered-up the strength to open the box. 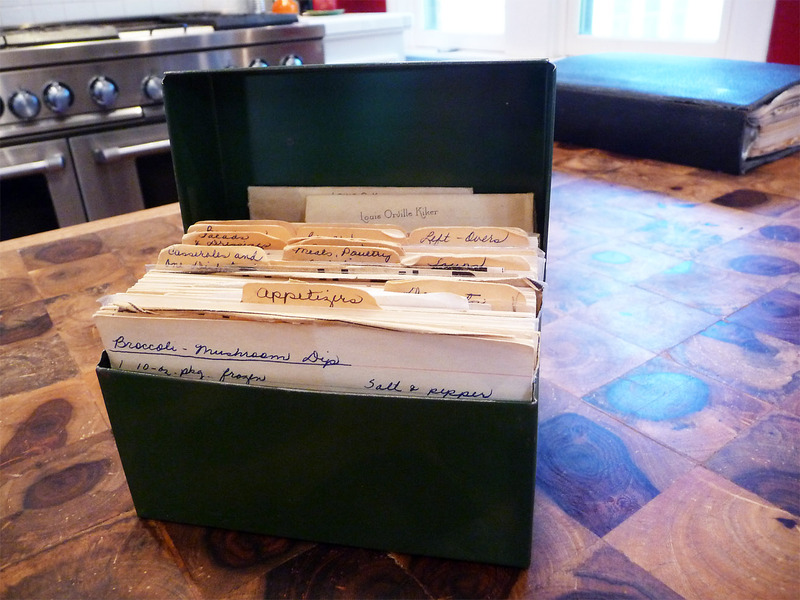 Inside were two items of Mom’s culinary legacy ~ a black binder and a metal box – an index card holder. Both, were strangely familiar, like a dream remembered. The book: The cookbook is a two inch thick three-ring black binder that has tabs with the date “11-15-54” on the first tab. In addition to hole-punched pages, it has “loose” pages stuffed here and there and looks to be a former address book/organizer (with tabs labeled from A – Z and Jan – Dec). It morphed from a mere organizer into a recipe book in the front half, and surprisingly in the back half, a section for South Texas gardening tips, including some sketches and details for what plants Mom grew in the family garden. The plant names? I don’t recognize many, which makes them even more special. I’ve recently (2016) created a gardening tips section here at BCN and you can find some interesting gardening tips including how to fashion homemade potpourri. I instantly recognized Mom’s elegant handwriting, which was always set in graceful cursive, including happy-curly ends for special (chosen) letters. Mom’s handwriting leans to the right, as if to say “let’s go!” You’ll see examples of her handwriting here, as most recipes include scans of the actual index cards. Click on the photo at right for a better view. I later found a few samples of Dad’s handwriting, set in his distinctive ALL CAPS style (I’M NOT YELLING, just telling). I write in ALL CAPS, TOO, depending on the day. I’m amazed how many of the pages are individually typed (not laser printed). 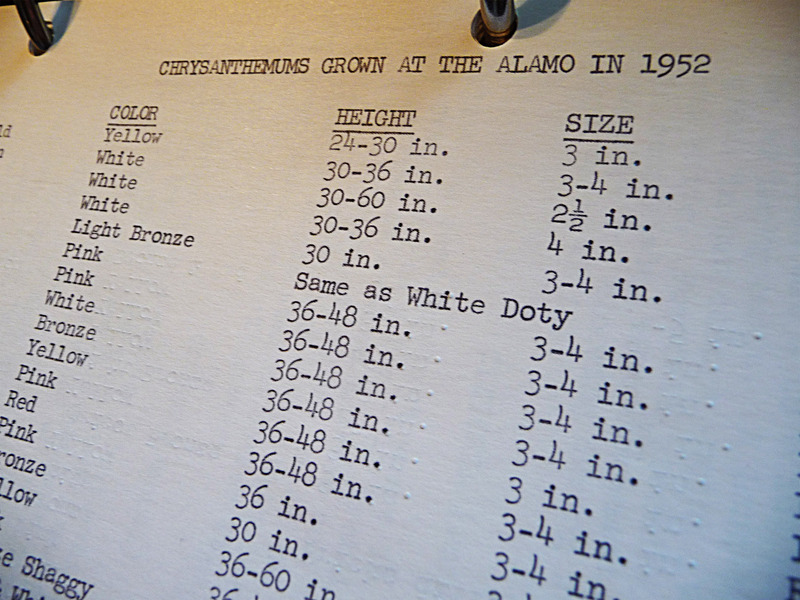 Running your fingertips on top of the pages will treat you to the dimpled indentations left by a typewriter (view some close-up dimples by clicking the photo below). “Rack. Clack. Clackity. Click. Bing!” I’m reminded of the sweet sounds of Mom’s typewriter, clear as blue skies. Mom spent her later years working as a court reporter and she could type faster than the wind. While writing this post, I paused to appreciate how different life was just 40 years ago before modern tools like the copier, computer and digital scanner changed how we chronicle… archive… communicate. One page has a hand-written list of clothes, food and sundries my family took on vacation on “10-2-1962,” before I was born. No doubt my parents and two older brothers headed south, bound for the Texas coast. Even in October. Some people’s names on recipes, I know not. 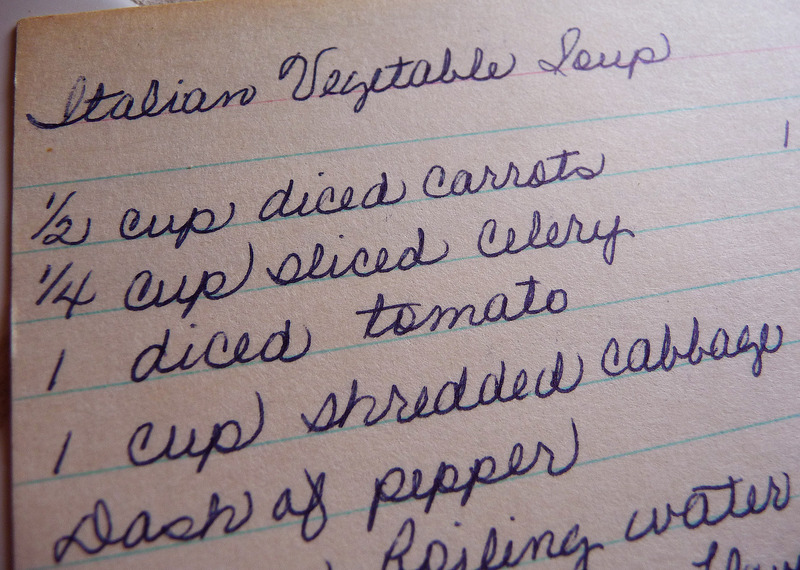 And some recipes are nameless, and are penned in handwriting I don’t recognize. Sadly, I don’t see any of my closest grandmother’s recipes (Nanny! )… unless they sit disguised, being penned by Mom and without a “Nanny-credit.” Unlikely. Calling-in the reinforcements… my Cousin Julie! I’m frustrated by the fact that I don’t have a single recipe from Nanny’s kitchen ~ she was my life, just two generations away. I’m reminded how precious life is… how deceivingly easy it is to take things for granted… and how quickly we can lose “true life itself” if we don’t dedicate time to protect and share “it” for the future. The more I’ve come to know the people of Italy, the more I believe Italians have mastered the art of preserving the essentials of life’s history with ease. Nanny, I miss your signature fruit salad *with coconut,* your amazing waffles we’d eat on the weekends and your chicken soup chock-full of wonderfully wide egg noodles! Roger says he misses your Angel Food cake topped with chocolate frosting and sliced almonds you’d make him every year for his birthday. 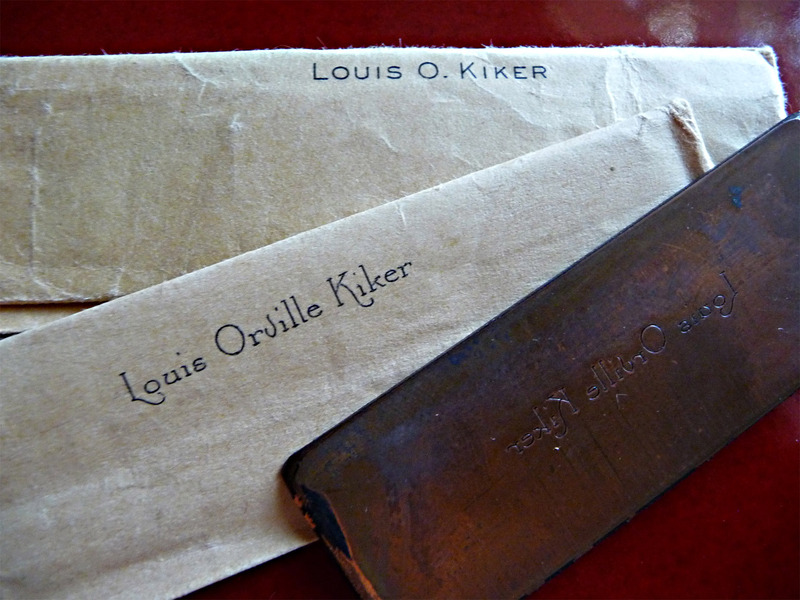 Safely tucked away inside the back of the small metal box (between the last of the index cards and the lid itself) are two small two-inch wide metal plates (slugs) with my dad’s name “Louis Orville Kiker” etched into them. I believe they were used in an offset printing process to make his business cards. One plate has an elegant script-y font and the other a clean, sans-serif font. I’m guessing the oil and gas company where he worked (“Palmco”) had a mass of generic company cards printed first (bearing company name, address and phone only) and as people were hired, their names were later printed on the shells to create customized business cards. Both the cookbook and index card holder emit the wonderful smell of “old,” a smell I cannot put to words … and one I don’t think can be re-created without time … and lots of it. I realize now that had Mom’s cookbook been given to me “back then,” it would probably be sitting in a dusty box today, along with some of my parent’s “other stuff.” Now that I’m 44 years grown, how awesome it is to believe I understand the true significance of recovering Mom’s cookbook at this most notable chapter in my life. I love it! And I can contribute Nany’s orange date cake that she made many Christmases that I can recall. One of the key steps was to soak it in RUM over the several days (and weeks!) before the holiday. I’ll look it up and send it on today. I figured you would have some of Nanny’s recipes! I’d love a scan if you can get one… so we’ll have a sample of her handwriting. I won’t ask about the time you went to get some good cabrito… although now I’m curious! This is a great story! Thank you for sharing it. Next time I’m in town let’s go through some recipes… I think you hold a magic key for a lot of tasty treats… and especially memories! That is truly a treasure Patrick! I was bequeathed my grandmother’s cookbook several years ago from my mom. It is barely holding together. It’s a copy of The Fannie Merritt Farmer “Boston Cooking School Cookbook,” along with recipes she clipped from newspapers & other places. In the cover of the book, she has written a few of her own! Like one for homemade sauerkraut. What a find! Thanks for reminding me I need to preserve these before they fade. I hope you preserve those recipes and make and eat some of them along the way! 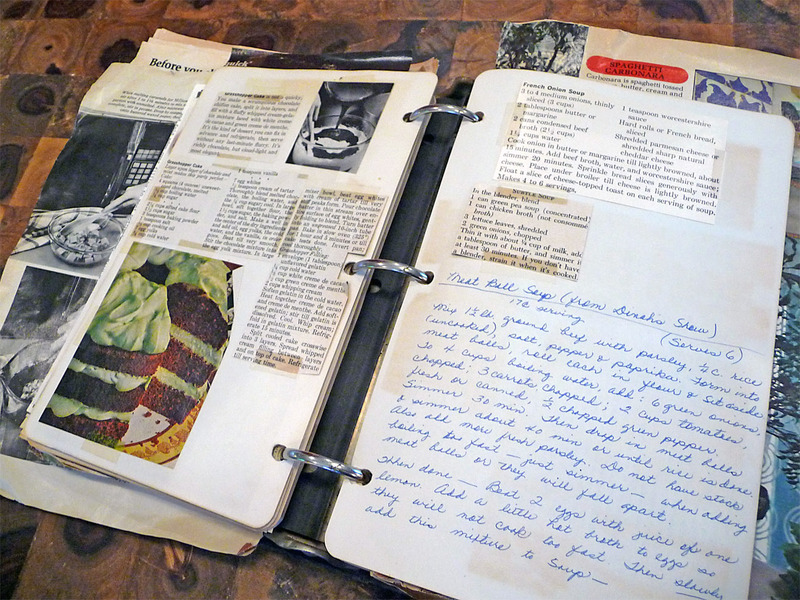 I’m going to scan the rest of Mom’s recipes “all at once” soon to help keep the pages in good condition. But like you point out the old pages of yesteryear can’t last forever. If you have any questions about how to setup your own digital cookbook blog let me know – I’m happy to help. Thanks for writing!